The Azerbaijani team was successfully represented at the international rhythmic gymnastics tournament held in Varna, Bulgaria on September 1-2. About 200 gymnasts from 15 countries participated at the tournament. 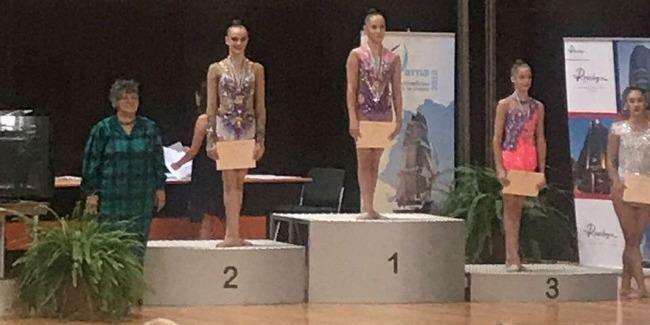 Thus, young gymnast Yelizaveta Luzan, who performed at the individual program, earned bronze medal of the competition taking 13.900 points from the jury for actions with the ribbon. The national gymnast reached fourth place in the in multi-race competitions, as well as, took sixth place in the exercise with ball and mace. Another gymnast Maryam Safarova ranks 9th place in the multi-race competition. This August, Luzan captured first place among gymnasts born in 2003-2005 in exercises with a hoop and the second place in exercises with a ball in the competition of 25th Azerbaijan and Baku Championships in Rhythmic Gymnastics held in the National Gymnastics Arena in Baku. Moreover, Azerbaijan Gymnastics Federation, which has great experience in holding international events, will organize the World Cup in artistic gymnastics, trampoline and tumbling, as well as the Rhythmic Gymnastics World Cup and World Championships in 2019. Organization of major international gymnastics competitions in Azerbaijan plays a big role in the development of sports in the country and also has a positive impact on the development of sports tourism.